More than 50 years ago, a doctor implanted the first mechanical heart pump, also known as a ventricular assist device (VAD), in the chest of a patient whose heart couldn’t pump blood on its own. Since then, the devices have saved countless lives, including that of Ismail Tursunov. The 24-year-old man was experiencing end-stage heart failure when doctors in Kazakhstan implanted a VAD into him in December. But the device in Tursunov’s chest is unlike any other — it charges wirelessly, eliminating one of the biggest points of failure in a device that cannot afford to fail. 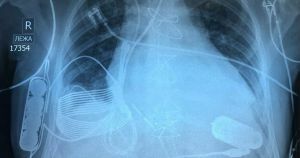 Typically, a VAD charges via a power cord that runs from the device and out a hole in the patient’s abdomen. The cord then connects either directly to a power outlet to charge the device or to an external battery. Patients with traditional VADs must always have backup batteries on hand in case the power fails on the one they’re currently using — they only have about 15 minutes to replace it before the heart pump stops working. The hole through which the power cord runs is also a hotspot for infections, so patients must be diligent about spotting any early warning signs. But Tursunov’s VAD doesn’t need that power cord thanks to a charging system created by Israeli tech company Leviticus Cardio. The system comprises a receiver inductive coil, a battery, and an internal controller, all implanted in Turnsunov’s chest. The device gets about eight hours of use out of a single charge, and when Turnsunov needs to recharge it, he slips on a vest containing an external coil that charges the inner coil electromagnetically. A wrist monitor helps Turnsunov keep track of his VAD, and if the battery gets too low or the device experiences some other major malfunction, an internal vibration alarm is triggered. Just in case something goes wrong with the wireless charging system, Turnsunov does have a wired back-up option, but he hasn’t needed to use it once since his surgery. Nir Uriel, a leading expert in VAD systems and Director of Heart Failure, Transplant, and Mechanical Circulatory Support at the University of Chicagowho was not involved in the creation of Leviticus Cardio’s VAD, attended the press conference announcing the system and was quite enthusiastic about it. “We, the medical community, cardiologists, cardiac surgeons, VAD coordinators, and the patients have wanted this for decades,” he concluded. The post New Bionic Heart Charges Wirelessly Inside Patient’s Chest appeared first on Futurism.